The HNBA’s “Top Lawyers Under 40” Award celebrates and highlights the accomplishments and contributions of HNBA members who have distinguished themselves in the legal profession. 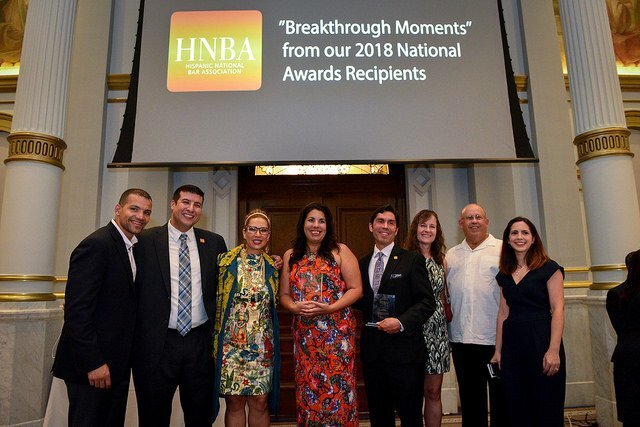 The Award honors lawyers who have demonstrated professional excellence, integrity, leadership, commitment to the Hispanic community, and dedication to improving the legal profession. HNBA Members from all segments of the profession (including private practice, government, public interest, academia, and corporate legal departments) are eligible for the Award. The Awards will be presented during the 10th Annual Corporate Counsel Conference in Albuquerque, NM, from March 20-23, 2019. *NOTE: Active HNBA membership for both the nominator and nominee is a requirement in order to be considered for the award. We invite you to join us by clicking here. As of the date of nomination, each nominee must: (a) be an HNBA member in good standing; (b) be a duly licensed attorney in good standing in at least one U.S. jurisdiction; (c) have no disciplinary action pending or adjudicated against him or her; and (d) be under 40 years of age as of March 23, 2019. The nominator, the person making the nomination, must also be an HNBA member in good standing on the date he or she makes the nomination. Note: Self-nominations will not be considered. The deadline to submit a nomination has passed. Please complete the HNBA 2019 Top Lawyers Under 40 Award Nomination Form for each person you want to nominate and submit, along with the nominee’s résumé and/or biography. NOTE: Please e-mail entire packet of materials in ONE PDF to Erika Lopeztello, HNBA Director of Operations, at elopeztello@hnba.com. You may also include up to two (2) recommendation letters (limited to 350 words or fewer), but the letters are not required. All nominations will remain confidential absent the express consent of the nominator and the nominee. Only award recipients will be notified. The HNBA National Awards Committee will review all nominations and will make recommendation of the award recipients to the HNBA Executive Committee. Award recipients will be announced in late January. There is no limit to the number of award recipients. Awards will be presented at the HNBA Corporate Counsel Conference March 20-23, 2019, in Albuquerque, NM (attendance by award recipients is strongly encouraged). Award recipients will be profiled on the HNBA website and in other HNBA publications. Please contact Erika Lopeztello, HNBA Director of Operations, at elopeztello@hnba.com.